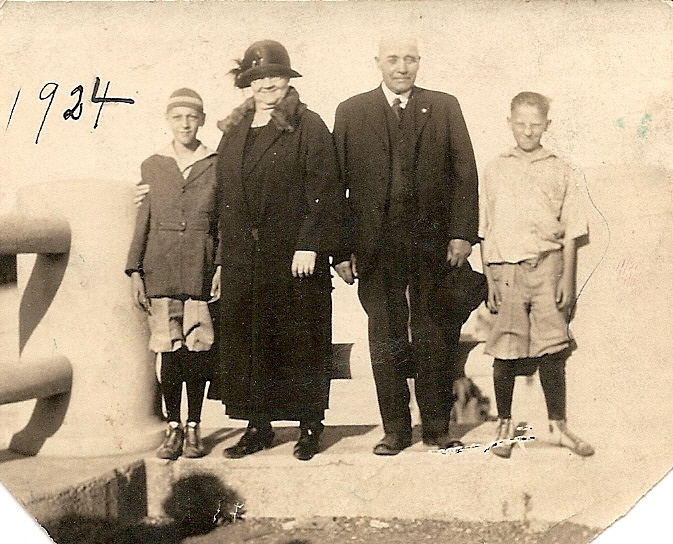 Laura Christine Kofoed was born in Milwaukee, Wisconsin on October 20, 1860. She is the eldest child of Martin Hanson Kofoed and Johanne Marie Johnson. 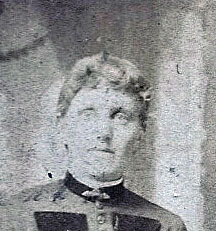 By 1870 she is recorded on the census as living in Gibraltar, Door County Wisconsin and attending school. The area she was raised in was near Fish Creek and is currently part of Peninsula State Park. 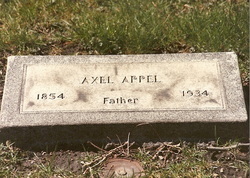 Axel became a naturalized citizen in 1880 and in 1881 their first child Carl Albert Appel is born. In 1883 he petitioning the state government for approval to built a dock in Lake Michigan and get the approval. The dock and a store was built at the end of the present Appleport road. 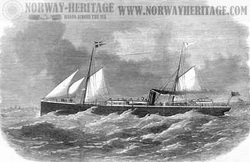 The pier is mentioned in an article from the Milwaukee Sentinel on April 25 1883. It says the dock will be 1000 feet long. From here he shipped cordwood to Chicago. 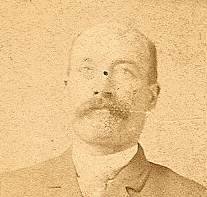 Axel sold the dock and store to Captain HA Porth in September 1884 and then did some faming on the present Sunstrom farm on County road 22 in Liberty Grove. In 1887 their second son Ralph Martin Appel is born and in 1895 he sold the farm to the Sumstoms and moved to Chicago. This move was in hope that the doctors in Chicago would be able to help Laura with a sickness that she had contracted, however on July 17, 1895 she passed away despite the doctors efforts. 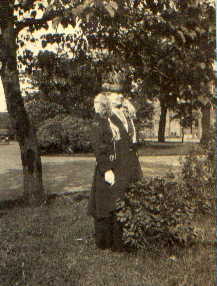 Laura was buried in the Mount Olive Cemetery in Chicago. 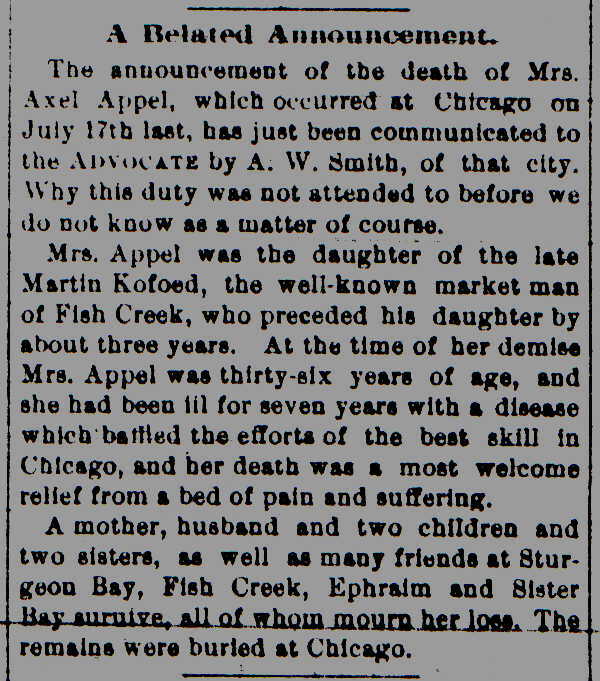 Her death is noted in an article in the Door County Advocate date August 3, 1895. In 1895 we find Axel is living at 847 East Chicago and is listed as a driver. The area in Chicago is where many Sweeds settled. 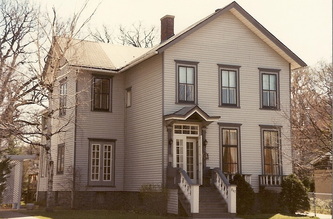 On April 24, 1899 he married Emily Gustafsen Appel in Kenosha Wisconsin. She was the wife of his deceased brother John. Axel also took on the responsibility of raising two additional children Cora and Harry. He was working as a motorman on the street railroad through the 1930 census. 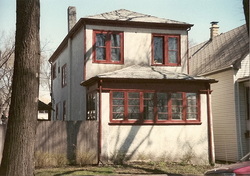 They lived in a number of rental houses prior to buying a house at 630 South Cuyler Street in Oak Park, Illinois in 1930 The Census notes that he owned a radio.